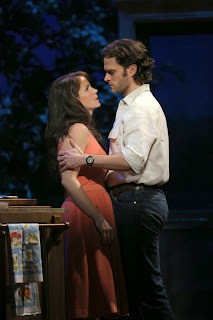 Kelli O’Hara, once more in the sensitive hands of director Bartlett Sher (“South Pacific,” “Light in the Piazza”), quite surpasses all her previous fine work with her portrayal of Francesca, a displaced Neapolitan woman living with her husband Bud (Hunter Foster) and their teenage children (Caitlin Kinnunen and Derek Klena) on an Iowa farm. The flatness of the landscape – physical and metaphorical – has her longing for the country she left behind. When Bud takes the kids to the annual State Fair in Indiana, Francesca encounters Robert, a hunky National Geographic photographer who has come to photograph the famous covered bridges of the area. The attraction is palpable, and though they try to keep a lid on their emotions, it isn’t long before they have fallen passionately in love, and into Francesca’s bed. What will Francesca do when her family returns? Will she forgo the love of a lifetime for the sake of her clearly decent husband and kids? Therein lays the conflict, and the life-choices theme of the story. Given the intimacy of the drama, with the focus on these two characters, Brown’s musical opportunities are perforce limited. And yet, he has managed to seize every opportunity to vary the mix with, for instance, a number for Robert’s ex-wife, some tunes for Bud (and Foster is excellent, as always), a 1960’s pop ditty, sung with delightful incongruity by Cass Morgan as Francesca’s nosy, but ultimately warm-hearted, neighbor Marge, while the lovers are dancing (“Get Closer”). There’s further musical variety in the second act at the State Fair scene and a Gospel flavored number, “When I’m Gone” led by Michael X. Martin, also very fine as Marge’s long-suffering husband. Sher’s staging on Michael Yeargen’s sectional, abstract sets (gorgeously lit by Donald Holder) allows characters in different locations (and even times) to occupy the same stage space, a device which, though skillfully managed, sometimes smacks of economic necessity. Still, the staging is never less than accomplished and nicely fluid. As indicated, the musical gains in power throughout the evening, and the second act, packed with more dramatic and vocal variety as it is, is completely compelling, and justifies its fervent standing ovation.